I have been a hospice nurse for 5 years. I have been treading water in an ocean of grief that is compiled of the collective tears of my community. In my relatively short time as a hospice nurse, I feel like I have seen enough suffering, pain, and sadness to put to shame any fictional work that has ever come out of Hollywood or been written by the greatest of authors. If art imitates life, it’s failing miserably and can’t hold a candle to what I have seen play out, from the most complex to the beautifully mundane. I’m now at a point where my identity as a hospice nurse has overshadowed my previous identity as a U.S. Marine. With each patient that I connect with and work towards getting comfortable, there is a change that occurs within me. It draws my heart closer into this field, even as my mind tells me sometimes that I can’t take much more of this. One thing that I retain from my military days is a fighting mentality, and that I believe is of absolute necessity. I was never deployed to a combat zone, so I won’t claim to have any knowledge on the matter, but I believe that hospice nurses are “at war” when we don our scrubs and tend to our patient’s needs. I use that terminology in this context in the same way our government does when talking about the “war on drugs” or the “war on cancer.” I certainly don’t intend to diminish the sacrifices that my brethren make on the battlefield when I say this. I do believe we are fighting though, and must have the resolve and tenacity of a fighter when we advocate and care for our patients. I recently had this mental image of fighting as I was showering for work. Having worked the previous day and been drained, I knew I was in store for another long 12 hours. I realized that I better muster the energy and will to fight my patient’s pain, dyspnea, anxieties, and fears. I not only am fighting those symptoms though, I’m also fighting against misperceived notions of what hospice entails, and I’m fighting against my own compassion fatigue. Every shift is a battle. The unfortunate thing is, even if I do an exceptional job with symptom management, provide holistic care, and meet all the needs of the patient and family, at the end of the day—a wife lost her husband, a son lost his mother, a family suddenly was thrust into one of the worst days of their life and I was part of it. It feels hard to go home and tell myself that I won the battle when their loved one just lost theirs. Some time back, I was asked to speak among my healthcare community about why I like working at hospice. I shared a quote that I felt helped to shed just a little light into the why. “We enjoy warmth because we have been cold. We appreciate light because we have been in the darkness. I have seen many moments that I have termed “beauty in the sadness,” and I believe, or at least hope, that those loved ones who are left behind when my patients pass on will reflect on the moments of beauty and joy amongst all that sorrow as I know I have. The battle continues. As a 20 year hospice nurse, I have come to realize how closely death resembles birthing. It has sustained me. They are both holy, and sacred moments, I have come to believe just as we are born to a mother (always), we will be born to another nuturing soul as we emerge from the chrysalis of this time. Attending the death of another as their midwife, brings me closer to the veil of the next life than anything else possible. It is an honor. Jon, I am not moved to write ‘messages’ often, but you have reminded me of the wonderment I continue to feel. Thank you. Take care of yourself and your mental health. Seek out support from your peers, doctors, and even your social workers. This is a highly stressful type of nursing. Please don’t ever feel “I can handle this alone….” I found out talking and sharing my feelings was helpful for me and my patient care benefited also. God Bless you in your work. GREAT article and thank you for your service to our country. Hi Jon. Wow…so beautifully stated. I worked in hospice for 3 years and it was the most rewarding specialty in my 30+ years as a nurse. I have always wanted to put my experience into words…and your comments provide a wonderful summation of what it means to work in hospice. Thank you. I really enjoyed your article. You touch so many lives and the work you do takes that special heart. You and the staff was there for my father-in-law this year. We could never express how much in our time of sorrow and grief you gave so much. Thank you. Thank you to all of you for taking the time to share your kind words and feedback. I am honored to have this forum to share my thoughts and feelings on being a hospice nurse. The past five years have not only strengthened my clinical practice, it has helped me grow as a husband and father. Hi bro Jon, your story is an awesome and heart warming tale that everyone can relate with. Thank you for sharing. I love to read articles that hit my feelings on the head. I have also been a hospice nurse for about 5 years now and learning how to balance and understand the beauty in death has been a long road for me. I always explain to people how humbled i am that I am allowed to be apart of such raw intimacy of a death. I consider myself blessed and am always in see of how it grows my soul. Great read!! I’m also a Hospice Rn of 6 yrs ..on the end side of my 7 days on call , hoping to get to the 7 off.. .Spot on my friend .. Ty, this helps get thru the next 48 hrs lol. I have the double blessing to have worked with Jon at Our Hospice, but also to watch him provide the most excellent care for my own father as he journeyed through his end-of-life condition. I cannot say enough to express my extreme gratitude to Jon and all of the team who helped my dad. 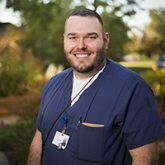 It certainly takes a certain kind of human being to provide true hospice care, and Jon has quite eloquently penned a hospice nurse’s perspective. Thank you to Jon and all hospice providers! As a fellow hospice nurse for the last 6yrs, this is so beautifully written and absolutely 100% accurate! I am still very close with many of my former patient’s families! I get cards, calls, and texts during the holidays! I get hugs and kind words when running into them in the grocery store (it’s a small town). I’ve cried countless tears with my patients and families, and the sorrow is often almost too much to bare, but knowing how many lives I’ve touched makes the reward worth it. In a sense, we become part of their family!